The Passaic River is one of the most polluted waterways in New Jersey. (Newsflash, right?) New Jerseyans are no strangers to this fact. 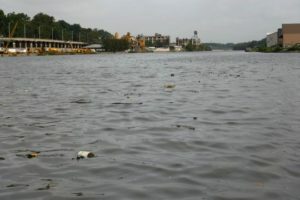 But you may not know that 299 organic compounds associated with microplastic pollution were found in water samples from the river, according to a recent study by a research team at Rutgers, New Brunswick. Microplastics are small pieces of plastic debris less than 5 millimeters long, or about the size of a grain of rice. These result from the disposal and breakdown of consumer products and industrial waste. The majority of microplastics found in this study were those from larger plastic items such as single use coffee cups, soda and water bottles, and straws. Following these larger plastics were compounds from polystyrene and films from broken down plastic bags and wrappers like those from candy and chip packaging. When we imagine hazardous waste, we think hypodermic needles and industrial waste, so what is exactly the problem with this kind of pollution? These compounds affect the environment in a number of ways. 1. They bioaccumulate in organisms. This means that once they enter into an animal’s body, they stay and slowly build up toxins in its body. 2. They pollute our fresh water. The Passaic River actually a source of drinking water for over 1 million of our fellow neighbors! But polluted water is shown to cause abnormal growth and heart defects in various species during laboratory testing. 3. We actually don’t know how bad toxins leached from microplastics can be. The environmental ramifications of single use products are still largely unknown because of the time it takes plastics to decompose. What is GSWA doing to answer this question? We are excited to roll out a brand new initiative that will begin to collect data on this very subject. As you may know, GSWA is dedicated to protecting and improving the water resources of the Passaic River region, from the Great Swamp headwaters to Newark Bay. Through education, advocacy, science, land preservation and stewardship, in collaboration with partners, we work to instill our communities with an awareness of water’s effect on health and the beauty of the environment. From October through December 2018, we are conducting a preliminary, baseline study for microplastics. We plan to collect samples along all four tributaries of the Passaic River in the Great Swamp Watershed, as well as the headwaters of the Passaic. In line with our chemistry sampling, we will also be sampling for microplastics in areas of the main stem of the Passaic River area, including the Berkeley Heights area, where elevated levels of microplastics were found by NY/NJ Baykeeper. Starting in the Spring of 2019, we will choose eight to ten sites to conduct a more in-depth study. Samples will be collected twice at each sample location, once in dry conditions and once in wet weather conditions. These samples will be collected in conjunction with Rutgers University, with one of their environmental studies students being a mandatory member of our sampling team. With this more extensive study we will be better able to quantify the microplastics in the sample locations, and begin to build a data base of the amounts and types of plastics found in these areas. Using the data collected we will work with communities on solutions for the growing issue of plastics in our waters. Though many local business and restaurants are beginning to reduce their plastic usage, cutting out single use plastics such as straws, more awareness needs to be brought to the issue. GSWA has a strong history of advocating for positive environmental change and microplastics is an important issue that is affecting our waters. What can you do to address this growing issue? Industrial polluters have been the culprit behind the pollution of the Passaic River for sure. We must remember that many items we use every day contribute pollution, as well. We can help our neighbors and the environment by keeping these items out of the environment by changing our habits. The plastics we so heavily rely upon may take hundreds or even thousands of years to decompose. As they decompose the microplastics become smaller, making clean-up efforts more difficult. You have, by now, surely seen the heartbreaking images of marine seabirds, turtles, and marine mammals entangled in plastic trash. Microplastics from these single use items are a nightmare plague for our waterways and oceans. It’s past time we asked ourselves the question: do we really need these items? The answer is simple. Don’t pollute the upstream. But how can we accomplish this? The easiest way to do this is to reduce your consumption of single use plastic products. This can be as simple as using reusable produce bags and shopping bags, or saying no to straws in restaurants. You can also make the switch from disposable to reusable water bottles. You say you have already done that? Have a few extra minutes in the morning? Bring a reusable mug for your morning cup of coffee. A disposable cup every day adds up, and many coffee shops even offer discounts when you bring your own. Bring your plastic Tupperware to the deli counter with you. And keep some extras in your car just in case. If there is a plastic product you can’t avoid or find alternative for, try to reuse the product for as long as possible. When it is time to dispose of these plastics, proper disposal is also key (click here for some great recycling tips to help keep our neighbors and environment safe from pollution) to preventing them from ending up in our waterways. Always secure your trash and recycling and cover it to ensure that it will not be spread by animals or wind. Check your local municipal recycling center’s website for their acceptable items. Above all, remember that saying no to just one cup or one bag adds up overtime and can prevent hundreds or thousands of plastic items from polluting our environment.